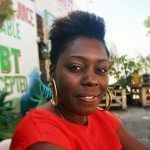 Ruth Jeannoel is a mother, wife, and a lead organizer with the Power U Center for Social change in Miami, Florida. Ruth was born and raised in Cambridge, Massachusetts, by her Haitian mom who emphasized education in her life. Ruth studied Social Thought-Political Economy & Women’s studies at the University of Massachusetts-Amherst where she built her political consciousness and got involved in on campus organizing. As a breastfeeding mother, parent, and Black women, Reproductive Justice is central to Ruth’s daily life through both her personal and organizing work. She continues her organizing work in spaces where it relates to uplifting the stories of Black and brown youth voices against the school to prison pipeline and highlighting the gender justice components around school push out. Ruth is a believer in the personal being political and has a strong commitment to developing new leaders to fight for the sake of Black liberation and self-determination. As the parade of police killings of Black people continues, Black people have a right to mourn together—and without white people. The medical community needs to do more to support women of color, particularly Black women, who must confront a number of hurdles in order to have a vaginal birth after cesarean.